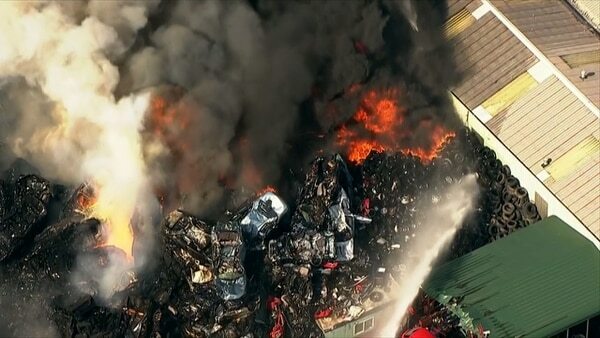 A Five-Alarm Fire at a Junkyard Sent Toxic Smoke Billowing Through a Portland Residential Neighborhood. State Regulators Had Looked the Other Way. 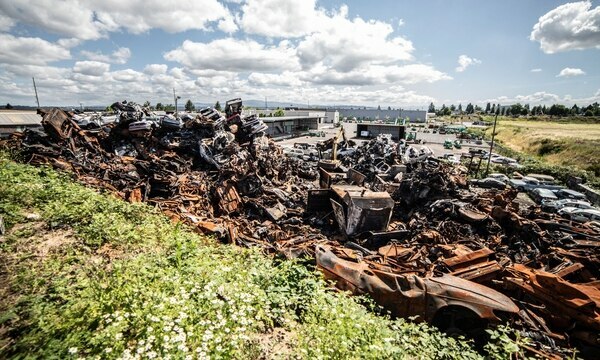 Along Northeast Killingsworth Street lies an immense graveyard of burnt-out cars. The dead vehicles are strewn in a pile the length of a football field, and glow with orange rust. It's a moonscape of metal. 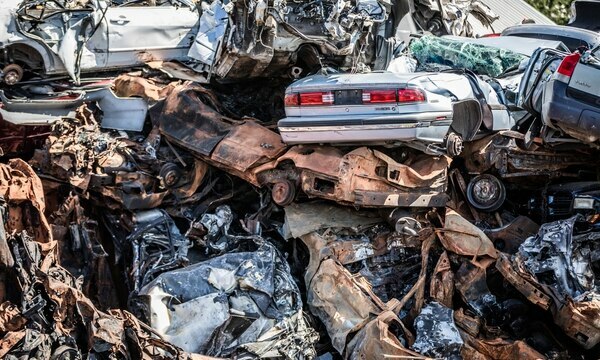 Twisted husks of Fords and Chevys, Toyotas and Kias are piled a dozen deep, their corpses welded together by fire. The junkyard abuts the backyards of single-family homes and a modest apartment complex. It's six blocks from a Head Start program, and two blocks from Cully Park—Portland's newest, dedicated last weekend by Oregon Gov. 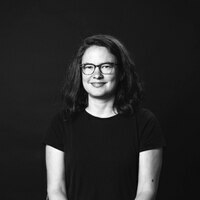 Kate Brown. It's an auto scrapyard, a site where workers tear apart junked and wrecked cars to sell the salvaged metal and tires. The business is called NW Metals. On March 12, it caught fire. The five-alarm blaze sent toxic, oily smoke billowing west across Cully, one of the city's poorest neighborhoods. It took 30 fire engines and 170 firefighters—a quarter of the city's force—to put the fire out. 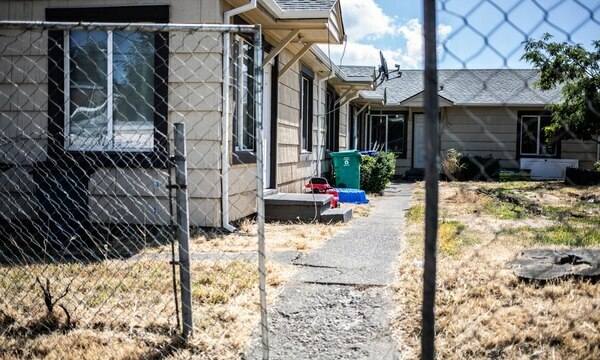 "I can't imagine living right next to it," says Mark Riskedahl, executive director of the pollution watchdog group Northwest Environmental Defense Center. "That was horrific. And preventable." 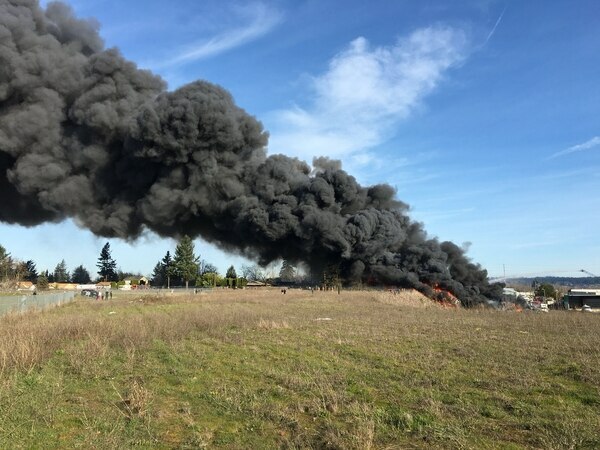 Indeed, records show the operator of NW Metals had a history of pollution so extensive that a federal lawsuit pressured him into shutting down his previous Portland scrapyard in 2015. If state regulators had looked at his new business, where he moved the year before, they might have found conditions that could turn a small fire into a serious health and safety hazard. But no environmental regulators had visited the property in four years. 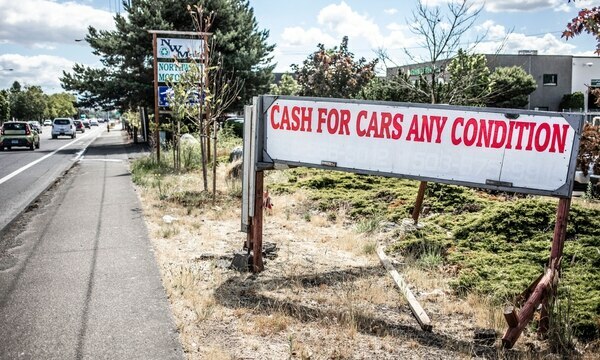 Oregon's auto scrapyards operate largely outside government scrutiny. The state doesn't require solid waste permits to open a scrapyard, and often doesn't check to see if businesses are following environmental laws. 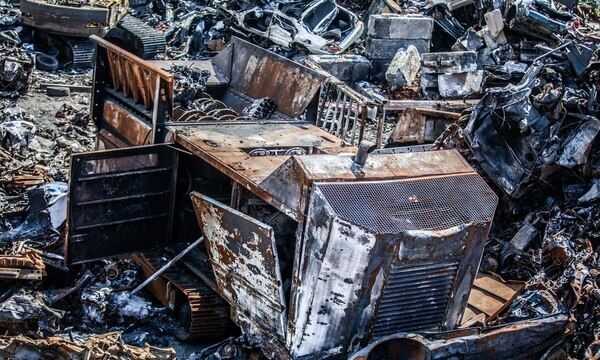 That's despite the fact that scrapyards deal with unusually toxic and flammable materials. "It's almost like a chemical-weapons manufacturer," says Riskedahl. "You should presume that something may go wrong." More government oversight might not have stopped a fire at NW Metals. But it could have reduced the size and damage of the blaze. Regulators could have seen the scrapyard was storing more than 1,500 tires—a chief fuel for the fire—and ordered their removal. They also could have restricted how NW Metals stored toxic chemicals such as antifreeze. "I knew this was a company that was heading for an environmental disaster," says Andrew Hawley, staff attorney at the Western Environmental Law Center in Seattle. "I didn't think it would be this extreme." As recently as December, the Department of Environmental Quality received a complaint that a NW Metals employee had been exposed to "car fluids." The report included an allegation that "used oil and transmission fluid is pooled on soil." State environmental regulators did not follow up. DEQ concedes it might have missed "opportunities to provide technical assistance," says spokesman Donald Oliveira. "Whether any of those actions could have prevented the extent of the fire and associated environmental damage cannot be known." Last month, the chairman of a state task force warned Gov. Brown that DEQ hadn't improved its oversight of scrapyards, even after the fire showcased loopholes big enough to drive a flaming truck through. Contacted by WW, Brown's office says she's asked for reforms. "I share those concerns," says Brown in a statement, "and I'm directing DEQ to review the current auto dismantling program." 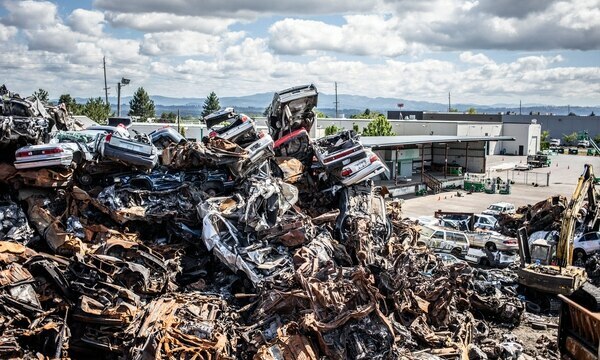 The failure to police auto scrapyards demonstrates the gap between Oregon's green ideals and its rust-colored reality. DEQ regularly convenes panels on global warming, air quality and water issues but has no system in place to protect average citizens from scrap metal pirates. 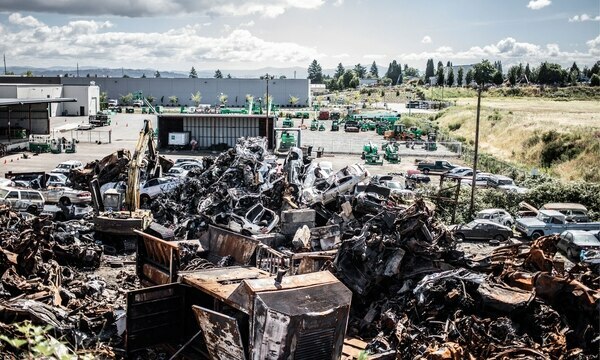 And the muted response to the scrapyard fire stands in contrast to the panic that followed the discovery of toxic moss samples near the Bullseye Glass Factory in 2016. That finding ignited a legal crackdown and a two-year campaign to create new regulatory power. But Bullseye happened in an affluent white neighborhood where the governor and her friends lived. Nobody powerful lives in Cully. The fire in Northeast Portland has yet to result in environmental reforms, even though its effects created more economic damage and immediate health risks. "Parents told me their children were coming home from school red-faced and throwing up," recalls Jess Faunt, an AmeriCorps member serving as communications specialist for environmental justice nonprofit Verde, which operates in Cully. "Low-income communities and communities of color tend to be disproportionately exposed to industry. This was [adding] insult to injury." Three months after the blaze, the rusted heap of cars is still there. 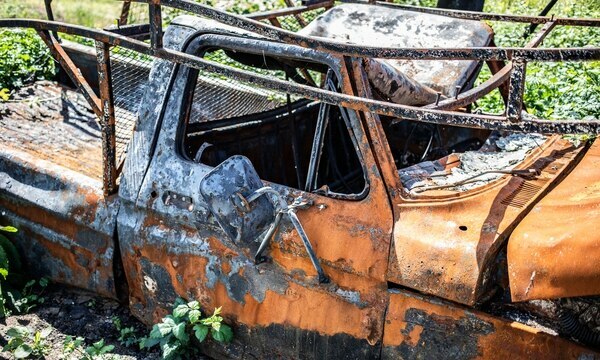 But shiny, painted cars are stacked atop the burned-out frames. Because NW Metals is back in operation. Junked cars are an enormous business. Enough steel and iron is recycled on an average day in the U.S. to build 25 Eiffel Towers. Most of it comes from cars. 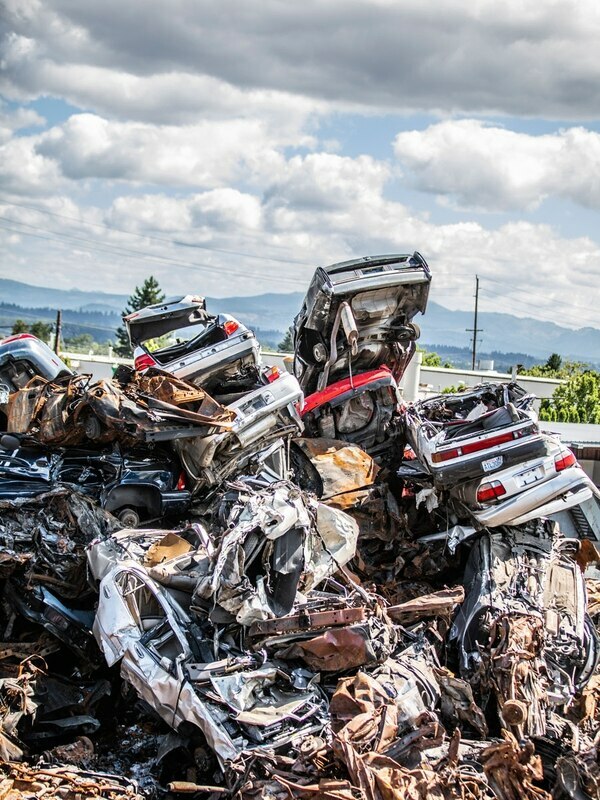 In Oregon alone, nearly 70,000 cars were dismantled last year. Some of them had stopped running. Others were totaled in wrecks. But scrapyards want these cars enough to pay cash—up to $600 for a Ford F-150—because the metal can be melted down and reused. Most scrapyards work on a much smaller scale than Schnitzer, running small lots along highways. At least 46 auto scrappers currently operate in Portland, according to state records. As long as people are buying new cars and getting rid of old ones, scrapyards have a vibrant market. Scrap industries—metal, plastics and other scrappers—employ more than 13,000 workers statewide. They're more environmentally sound than sending cars to the dump or starting over again from iron ore. But scrap metal can be a dirty business. Inside the yards, workers remove tires from vehicle frames. Some cars can be repaired well enough to get back on the road, and parts are salvaged. But the rest end up as fist-sized blocks of recycled metal. The cars are put through a shredder that can quickly turn them back into raw materials. 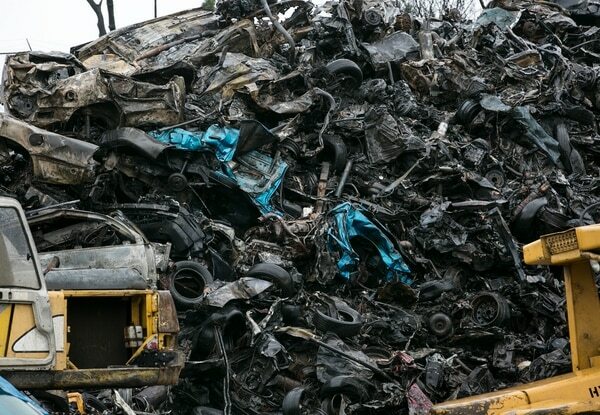 Before the cars are zipped through the shredder—which can separate the metal from plastics and upholstery in less than 30 seconds—the oils, antifreeze, battery fluid and gasoline are drained from the vehicles. Some of these can be recycled or treated as hazardous waste. Either way, they must be carefully stored. They're toxic. Windshield fluid can have the additional danger of being particularly flammable. Batteries can contain lead. Old switches can be full of mercury. DEQ advises that the work of removing the hazardous chemicals should be done indoors, or at least on a paved or concrete surface—something that prevents chemicals from leaking into the soil. If done outside, the state handbook for scrapyards recommends working under a roof. Into this world stepped Moyata "Mo" Anotta. People who've met him describe a gregarious 36-year-old who dresses in hoodies and flip-flops but drives a Cadillac Escalade SUV. He operates NW Metals and says his father owns it. 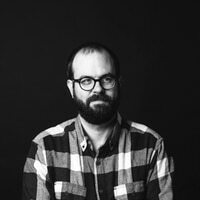 In 2013, records show, he opened a scrapyard—called Parkrose Auto Recycling—along the Columbia Slough in Northeast Portland, amid warehouses and office parks. Other scrapyard operators sensed something amiss. The business owners get to know each other because smaller scrapyards sometimes sell their cars to bigger operations, who can then sell to foreign markets in bulk. Anotta sold some cars to Metro Metals Northwest, which is big enough to export metal directly from the Port of Vancouver. 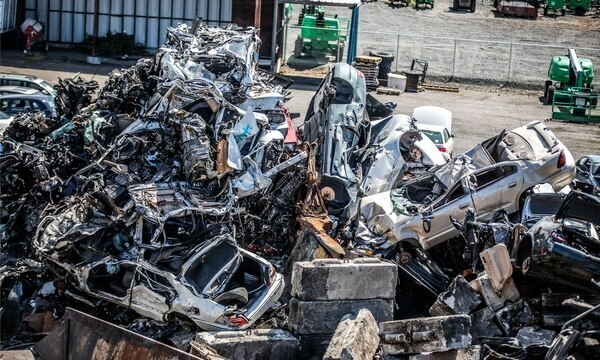 The heavier the totaled car the more valuable it is, because more weight means more metal to be sold off and recycled. Metro Metals Northwest president and CEO Victor Winkler says on multiple occasions, his employees found rocks in the trunks of cars Anotta had brought in—an apparent attempt to cheat the scales. Anotta blamed his employees, Winkler recalled. For environmental watchdogs, Anotta's operation was suspicious for another reason: It looked as though he was flouting basic safety rules. "I'd go by there at random times," recalls Riskedahl. "It was like a scene from Mad Max—there'd be guys blackened like they were working in a coal mine, ripping everything out. How is this even possible in modern-day society?" Mark Riskedahl admits he's obsessive. A 51-year-old lawyer from South Dakota, his idea of a good time is kayaking the Columbia Slough and looking for oil slicks that could point to an industrial polluter. 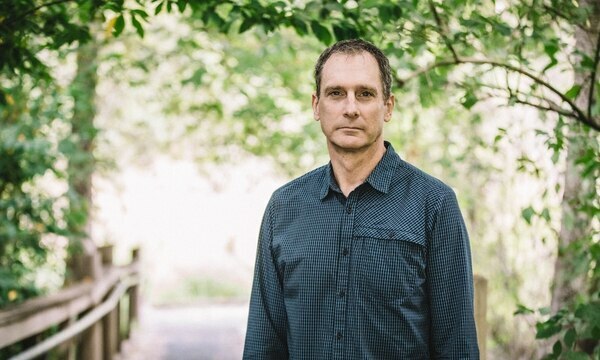 For 18 years, Riskedahl has been executive director of the Northwest Environmental Defense Center. It's a two-person shop that operates out of Lewis & Clark Law School, enforcing environmental rules when state agencies won't. The law he enforces is the federal Clean Water Act. The act of Congress, passed in 1972, requires a permit for discharging any pollution into navigable waterways. It allows private citizens, not just government regulators, to sue polluters to enforce those rules. The NEDC has filed more than 100 such lawsuits in the past two decades. "I do think there's a necessary role for citizens to step in and be cops," he says. "You don't just have to complain to some government agency, 'You should do something about this.' You can step in and do something yourself." In 2013, Riskedahl got a tip: Parkrose Auto Recycling was filthy. Riskedahl went to Northeast Columbia Boulevard to investigate. When rain came, Riskedahl found his evidence: a brightly colored sheen of oils on water as it headed down storm drains and into the slough. "It was everything that was on the inside of a car," he says. "They were the highest levels of toxic metals we had ever seen. They were off the charts." In spring 2013, Riskedahl's group filed suit in U.S. District Court in Portland, alleging Anotta's scrapyard had failed to obtain any stormwater permits. In the federal lawsuit, the NEDC alleged that "measurable concentrations of aluminum, cadmium, chromium, copper, lead, zinc, and total suspended solids" had been recorded in the discharge from the facility. Anotta fought for two years. In court filings, he claimed Riskedahl had tried to extort him. "Mr. Riskedahl said, 'I have free attorneys…so I recommend you settle with me by paying us some money and we will not bother you,'" Anotta wrote. "I replied to him by saying I am not in violation of the law…so I was not going to pay him no money." That argument didn't work. Riskedahl obtained a consent decree requiring monitoring of the scrapyard, and drew the attention of state regulators. The city and state ultimately fined Anotta $32,700 for water pollution. But he had already opened another scrapyard—one mile to the east, in Cully. "We did everything we could," Riskedahl says. "But I wish we had done more." 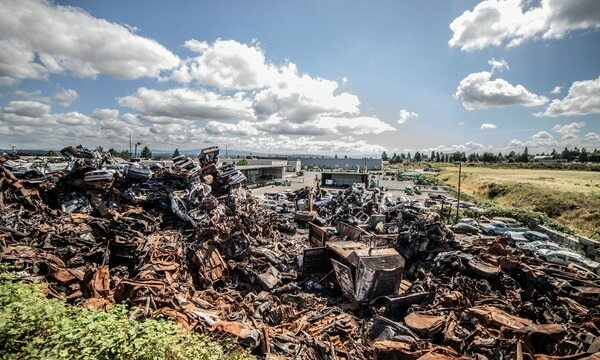 Anotta could open another scrapyard so easily because Oregon law requires no environmental appraisal of businesses that want to tear apart cars. DEQ is supposed to regulate industrial pollution. 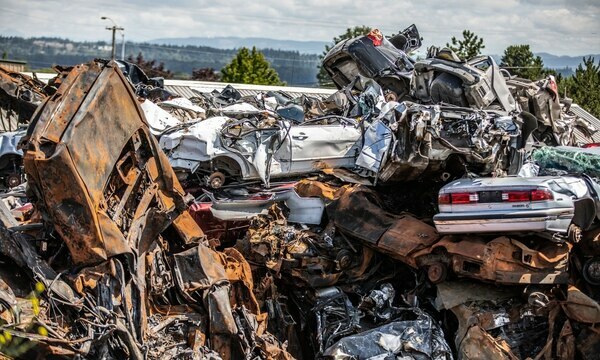 But an auto scrapyard can open with nothing more than a certificate to dismantle cars from the Oregon Department of Transportation's Driver and Motor Vehicles division. It just has to prove it operates on property zoned for industrial use. 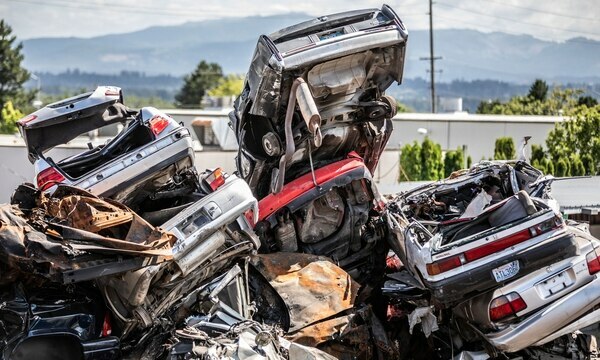 It's difficult to compare Oregon's oversight of scrapyards to that in other states, because most states regulate auto dismantling with a patchwork of rules. But the Oregon DEQ does have a solid-waste permitting process, which it applies to landfills. It requires business owners to disclose the materials they're handling and how they'll dispose of them. It just doesn't apply the rule to scrapyards. The chairman of the Oregon Environmental Justice Task Force, Joel Iboa, says that's a major regulatory failure. 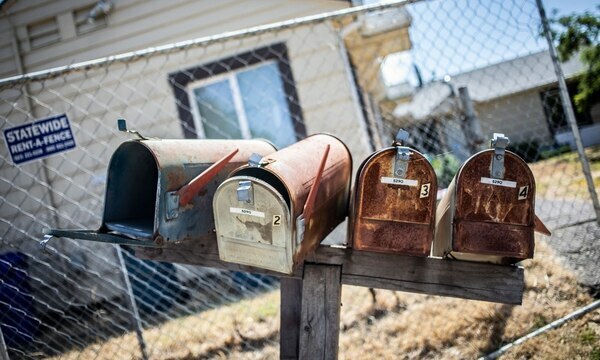 Last month, he wrote to the governor demanding DEQ improve its rules. "Though auto scrapyards handle uniquely volatile, persistent and toxic materials, they are not subject to a comprehensive DEQ permitting process," Iboa wrote. "We urge the governor to consider further action." Such a permitting system would have required NW Metals to account for how it was disposing of hazardous chemicals. Stricter oversight of permits could also have spotted the hundreds of rubber tires NW Metals was piling up—which require the state's sign-off. Hawley, who was Riskedahl's former staff attorney at the Northwest Environmental Defense Center, says he contacted several environmental agencies, asking them to closely examine NW Metals. "This is a failure at the city and state level," he says. "All the things we talk about—building a better place to live—and this is allowed to happen because of regulatory indifference? That just crushes me." Anotta's new neighbors in Cully were aghast. Harold Weathers, 73, lives a block east of NW Metals. He grew alarmed as the pile of cars grew 30 feet tall in the former gravel pit where Anotta had set up his new shop. But he didn't complain to DEQ. "I've complained in the past, and nothing's ever been done," Weathers tells WW. "So I'm like, 'Oh well.' I don't know who I would call and complain to." Others did complain about the site to DEQ—at least four times between 2014 and 2017. Records show the agency found no problems or took no action. On March 12 of this year, Hawley was in his Seattle office. He glanced at his phone and saw the report of a pillar of smoke down in Portland. He texted Riskedahl. "This is Mo, isn't it?" Salvador Ramirez Candela misses his birds. The three yellow canaries were his roommates in a shabby apartment on Northeast 75th Avenue. He didn't like the apartment: It was poorly maintained, and the noise from NW Metals filled his room. But the landlords were Mexican, like him, so Candela found it easy to get a lease. He didn't really mind the stacks of used tires 6 feet outside his back window. On March 12, Candela, a 52-year-old house painter, was watching television when he noticed water hitting his window on a sunny day. The water, from fire hoses, caught his attention around 9 am. Then he smelled the smoke and ran outside. He didn't think to take the canaries with him. "They didn't let me go back in and get the birds out," he recalls, speaking in Spanish through a translator. The birds died of smoke inhalation. "Basically, I lost everything." City investigators still don't know what caused the fire, and admit they probably never will. Somebody may have flicked a burning cigarette onto flammable material. Someone might have set it on purpose. The fire started in NW Metals' "fluff pile." That's the heap of tattered upholstery and plastics removed by the shredder. 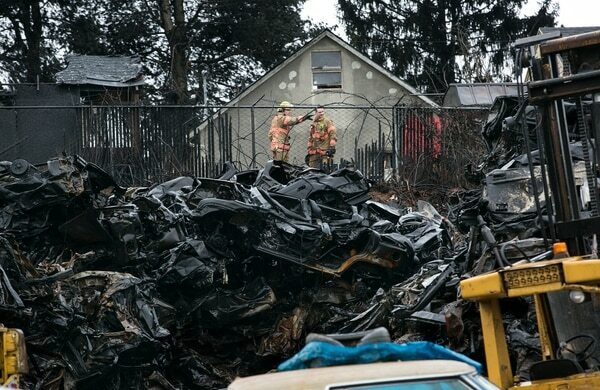 Two workers at the scrapyard had discovered the 5-foot flames in the fluff that morning and tried to put them out, according to Portland Fire & Rescue records. By the time a manager fetched a second fire extinguisher, the flames had grown to 10 feet. The night security guard heard their calls and showed up with a fire extinguisher of his own. But he didn't even try to use it: Several cars were already on fire. The 911 call came in at 9:04 am. Six minutes later, the first firefighters arrived to begin a battle with the blaze that would last another 36 hours. It was the largest fire Portland Fire & Rescue had fought in more than four years. It had no shortage of fuel. Cars were piled 30 feet into the air. There were at least 1,500 tires onsite. By 9:30 am, the flames were 40 feet high, the fire investigator reported. Black smoke unfurled over a swath of Northeast Portland. As TV news helicopters circled overhead, Multnomah County officials offered shelter to at least 145 people evacuated from almost two-thirds of a square mile of residential neighborhood—a procedure Jess Faunt at Verde describes as "a logistical nightmare." "Residents said they were evacuated late at night by bullhorn and hazmat suits," Faunt says. "By a car driving around with a loudspeaker." Nearly three-quarters of a square mile were evacuated when NW Metals caught fire on March 12. For Candela, the fire launched what he calls the worst month of his life. For a week, he couldn't retrieve his medications for diabetes and HIV. He couldn't move back into his apartment because the smoke residue triggered his asthma. He couldn't have safely lived there anyway; firefighters had broken down his front door checking for other occupants. Verde helped Candela find a new place to live, 20 blocks away. His former apartment complex now sits empty, sealed off by a chain-link fence to keep people from squatting in the vacant units. The landlord made him clean out his unit himself. He can still remember how it smelled of tires. "Like the wheels," he says. "Plastic. Burned." NW Metals is once again stacking cars. Mateo Sanchez, who lives one block east, has watched the pile of cars grow. "They haven't done anything," Sanchez says. "They're adding more cars on top of it." Sanchez looks at the scrapyard with fear. "I feel like it will happen again." In fact, state regulators finally showed interest in NW Metals after the fire. But they haven't even managed to make Anotta clean out the toxic waste left from the blaze. On March 27, DEQ issued an order to NW Metals to clean up the property of charred cars and tires. "Hazardous debris is present on site that poses the potential for ongoing impacts to groundwater beneath the property," the DEQ letter said. 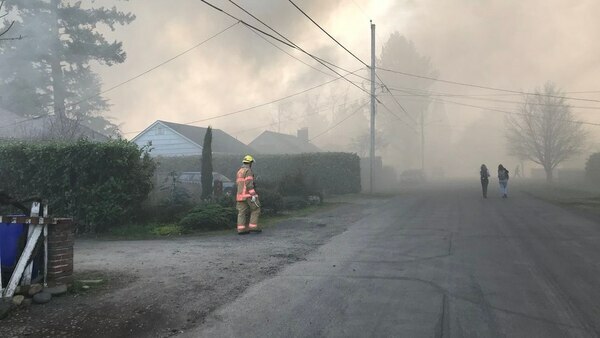 "The uncontrolled combustion process would have created and released a wide range of hazardous substances which spilled or were deposited to the ground after burning." But there's no timeline for a cleanup. Anotta says he's working on a cleanup plan with DEQ, and maintains the fire was not the scrapyard's fault. "It was a catastrophic event for us and caused our neighbors a lot of trouble," Anotta says. "NW Metals' compliance with environmental laws has not been identified by anyone as the cause of the fire." The fire bureau says it's waiting on DEQ. "The practices of that business are going to have to change," Capt. Louisa Jones says. "DEQ is going to be at the front of the line. They hadn't finished final evaluations." DEQ officials say they're working on whether to assess fines or take other actions. But the agency says it won't seek to put NW Metals out of business. "It is not in DEQ's purview to determine if NW Metals should be closed," says DEQ spokesman Donald Oliveira. "Our responsibility is to get the business back into compliance." Riskedahl isn't surprised. He says state regulators give scrapyards a wide berth. "There's a dynamic in Oregon," he says. "Pollute first, and ask questions later. And if you do get caught, only then will we hold you accountable. And maybe not even then."